Five a Side is a soccer game for athletes who are blind or visually impaired. Five a Side is played with five players per team, including a sighted goalie. The field is split up into three quadrants, providing coaches and guide with different areas on the field to assist players in being aware of where they are on the field. There are guides along the kick boards and behind the net to guide players with simple and direct instructions to advance on the field. There are no kick boards on the end lines of the field; if the ball goes out at one of the end lines, it is given to the sighted goalie. In this game, all participants except the goalies must wear eye shades. The goalies may also help with giving simple and direct instructions to their teammates on the field. Tandem cycling is both a Paralympic sport on its own, and a leg of the ParaTriathlon. At CAPA, we coach athletes on how to be a "stoker", the rider on the back of a tandem bike, and work as a team with their pilot. 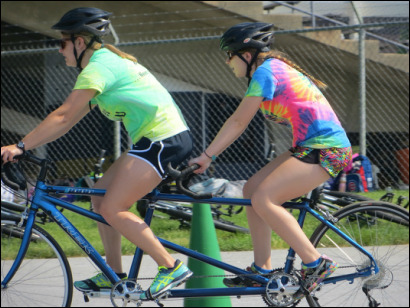 Tandem biking is one of our specializations, in which older athletes can choose to tandem bike twice at day at camp. At Camp Abilities PA, we train all of the athletes in all components of Athletics including track, jumping, and field events. The athletes participate in activities and drills that encourage proper running form, pacing techniques, use of tethers and guide runners, and trail running experiences. The athletes engage in long and triple jump drills to teach them how to complete an approach and maintain strong form throughout their jump. During the throwing activities at our camp, the athletes have exposure to shot put, discus, hammer throw, and javelin, accompanied by technical form training in order to help them achieve their longest distance using their best form. All of our training sessions incorporate USABA drills and specifications. For further explanation of USABA Athletics guide running and jumping please see the USABA Athletics Video. 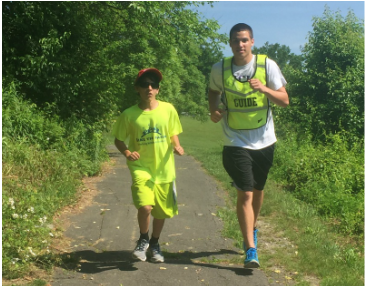 At CAPA, all athletes have the opportunity to participate in cross country running on the trails of the Gordon Natural Area. Trail running introduces a variety of concepts, such as pacing, changing speed or effort based on the environment, and what type of natural obstacles one may encounter in the woods. Additionally, trail running incorporates movement at varying speeds and over constantly changing terrain. These movements contribute to development of proprioceptive skills. Proprioceptive skills are of increased importance for students with visual impairments, since these skills enhance orientation and mobility. At CAPA, athletes receive coaching in the 3 v 3 Paralympic sport of goalball at the beginner and advanced levels. The objective of the game is to roll an auditory 12-inch ball across the 18 meter court past the opposing team. The opposing team uses their bodies to block the ball and roll it back attempting to score. Goalball encourages athletes to use their orientation and sensory efficiency skills, as well as work as a team. Beep Baseball is a sport for blind or visually impaired athletes. Beep baseball is played with a beeping ball and 2 buzzing bases. Games are six innings long with three outs per team per inning. Athletes swing and hit a pitched ball and run towards one of the buzzing bases. There are six fielders who try to field the beep ball. If the batter makes it to the base prior to the fielder finding the beep ball, a run is scored. Swimming is an outstanding physical activity for people of all ages and abilities. Whether a competitive swimmer or a recreational fitness swimmer, this sport is a healthy lifetime activity where individuals can gain strength and endurance that will help them to excel in other areas of sport. Specifically for athletes who are blind or visually impaired, swimming offers an environment where young athletes can exercise independently. Due to tactile landmarks within the pool, like lane lines and walls surrounding the pool, a swimmer who is blind or visually impaired can simply swim along the lane line to keep themselves straight and count their strokes for the length so they are aware of the end of the lap. Competitive swimmers can also utilize a "tapper" which is someone that taps the swimmer to signify they are nearing the end of the pool. Training swimmers who have limited vision is the same for those who have full vision with some small modifications such as placing large pace clocks close to a swimmers lane, using brightly colored lane markers and keeping a coach or another swimmer close by to give auditory cues for send off times. Besides these modifications, competitive swimming rules and expectations for athletes who are blind or visually impaired is the same as for those who are not. Swimmers are to perform each stroke "legally" according to USA Swimming guidelines. 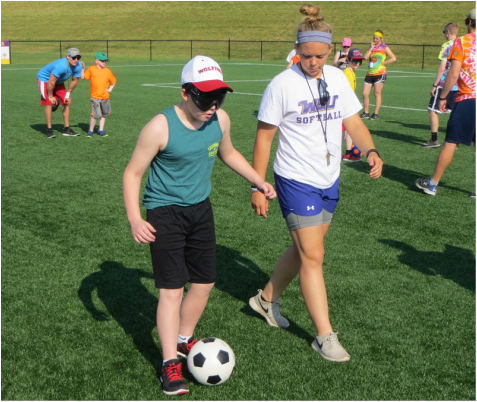 Here at Camp Abilities PA @ WCU, we train all our athletes, from beginner swimmers to advanced swimmers, with the ultimate goal of building their endurance while giving specific feedback on proper stroke technique so that they are efficient and legal in all four competitive strokes.